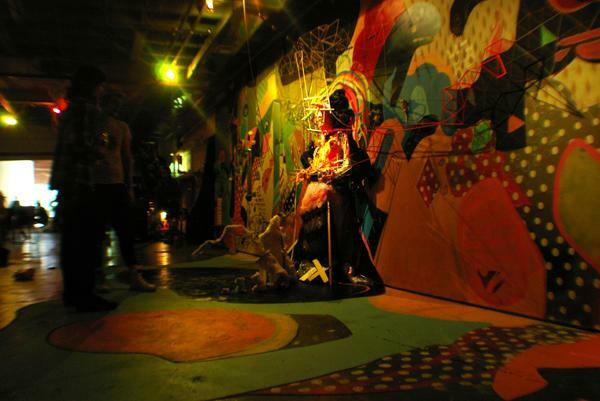 Meow Wolf, an art collective formed in 2008 in Santa Fe, is known for the external, explorable worlds it creates through multiple forms of media. The immersive exhibits are created by anonymous hands, presented only by the name Meow Wolf, without distinction of individual parts. The entity, Meow Wolf, is the artist. Comprised of hundreds of artists and thousands of viewers, this entity has evolved and absorbed and grown and failed and succeeded in ways that transcend any single individual. The entity, Meow Wolf, is the constant. What is Meow Wolf? As with any entity, represented to the world by the dominant aesthetics of past creations, known for its productions and expressions, its preferred colors and materials, its mode of communication and its processes of creating. Moving Still finds Meow Wolf in a moment of paused contemplation, the moment many beings experience when the past is complete and the future has yet to begin, when unexpected events remind us that we exist in a world beyond our control. Moving Still finds Meow Wolf pulled in hundreds of directions, asking “what am I doing with my life,” victimized by who we’ve become. Moving Still finds Meow Wolf thinking about Meow Wolf, and exploring the internal worlds comprised of memories, reminiscence, and contemplations of birth and loss. This program is sponsored in part by a Community Arts Grant made possible by the City of New Orleans. The grant is administered through the Arts Council of New Orleans. The National Performance Network is the fiscal sponsor of The Front. We thank you for your support.